Neuse River at Hwy 70 in Kinston. River is at about 19ft and is to top out at over 27 ft.
Hurricane Matthew is no more but here in NC his affects are still being felt. Many inches of rain fell on soils that were already saturated in many parts of the State. 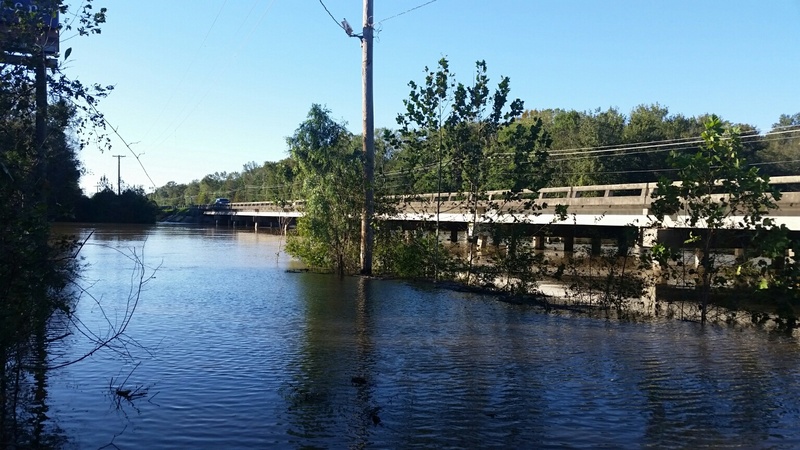 The result was flooding conditions that persist from the Triangle to Eastern North Carolina. Earlier this year, I touched on the role of floodplains in reducing impacts from flooding. Well, those in the eastern part of the State will be pulling a heavy load as waters from the Creeks around Raleigh make their way to the coast. In the Neuse, where record flooding has occurred at Smithfield, Kinston is the downstream end where floods pass before widening out into wider wetlands and, finally the estuary. Floodplains in these areas will be helping to reduce erosion and deposit sediments and pollutants before they make it to the tidal estuaries. Still, the pollution washing into the Neuse and Pamlico sounds will be terrible. Soil, waste lagoons, broken sewer and septic systems and other pollutants will end up washed into our rivers. Combined with the flooding, it will be catastrophic event for the state on many fronts. This storm is a tough hit for our state illustrating the destructive power of nature. It also demonstrates that we need to take proactive measures to protecting our natural assets like floodplains and wetlands that help to mitigate the impact of storms.